This is the must see free online video of 2010! In just six and half minutes you get a full insider's video look at the cutting edge technology of the Third Reformation! The Puritan Hard Drive will change the face of biblical (Puritan, Calvinist, and Reformation) studies forever ... and change your life for the glory of God! As you will see below, the new SWRB Puritan Hard Drive is "a true technological revolution in Christian (Puritan, Reformation, Presbyterian, Reformed Baptist and Covenanter) studies," for which we give the Lord all the thanks and glory! More videos are forthcoming shortly, as there are many powerful features on the Puritan Hard Drive to showcase. THE PURITAN HARD DRIVE CONTAINS OVER ONE MILLION DOLLARS WORTH OF CLASSIC AND CONTEMPORARY PURITAN, REFORMATION, PRESBYTERIAN (JOHN CALVIN), COVENANTER & REFORMED BAPTIST RESOURCES (IN OVER 12,500 PDF BOOKS, MP3s & VIDEOS) ON AN PORTABLE, EXTERNAL, 250GB USB HARD DRIVE (WITH WORLD-CLASS, CUSTOM, SEARCH/INTERFACE SOFTWARE & AN EMBEDDED DATABASE INCLUDED — SEE SCREENSHOTS BELOW INCLUDING THE RARE NORTON TRANSLATION OF JOHN CALVIN'S INSTITUTES)! Prepublication Discounts End Soon -- Order Today For Big Savings! The SWRB Pre-Publication Sale Price of $US797.97 (Plus P&H), for the Puritan Hard Drive (featuring many works by JOHN CALVIN), Is Guaranteed Until 11:59 PM (EST), Monday, September 13, 2010 (Even If We Begin Shipping the Puritan HD Before This Date) -- The Price for the Puritan Hard Drive After the Pre-Publication Sale Ends Will Be $US1,597.97 per Puritan Hard Drive. We also offer an interest free deferred payment option with payments starting as low as $US100/month. The interest free deferred prepublication price is $US1,000.00, plus P&H, per Puritan Hard Drive. If we continue the interest free deferred payment option after the prepublication sale ends (which has not been decided yet), the deferred payment price will go to $US1,797.97. Save $US800.00 by buying today (full details below), or before the pre-publication price guarantee ends! The new SWRB Puritan Hard Drive works on both PCs and Macs. SWRB's PURITAN HARD DRIVE is the most extensive and robust Reformation study tool ever created — thanks be to the Lord! 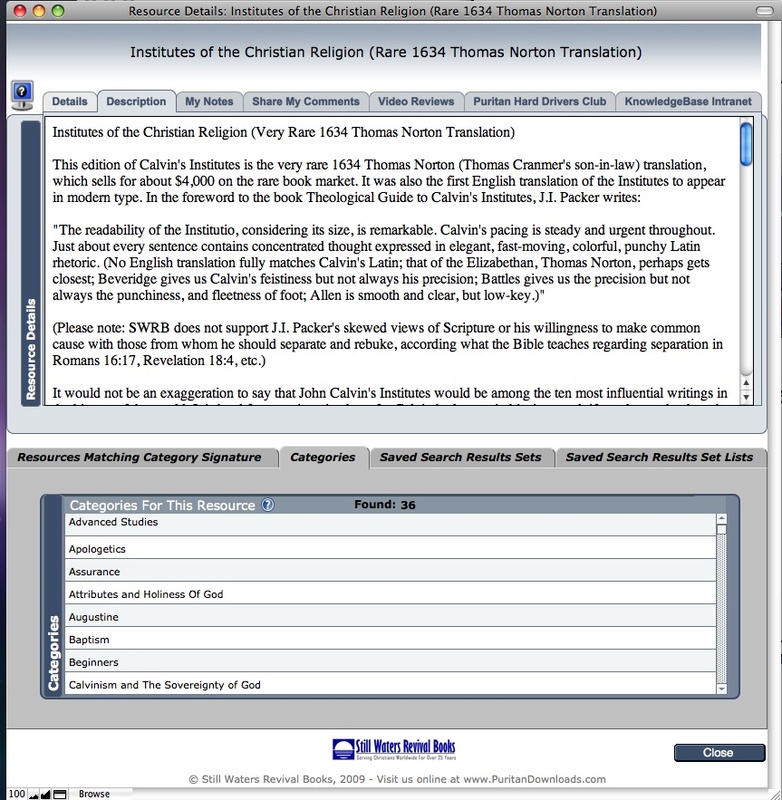 It presently contains over one million dollars worth of classic and contemporary Puritan and Reformation books (PDFs), MP3s and videos, a comprehensive custom search/interface program (SWRB KnowledgeBase, see screenshots below), and a powerful embedded database. The extensive world-class KnowledgeBase software and database are also fully upgradeable (via free Web downloads we will provide as new features are released), so the PURITAN HARD DRIVE can grow with you as you grow in the Lord. Moreover, all future SWRB publications (PDF books, MP3s and videos), as well as resources from other participating publishers, may also be downloaded free, or at a nominal cost (most for just 99 cents each), as they become available in the future. 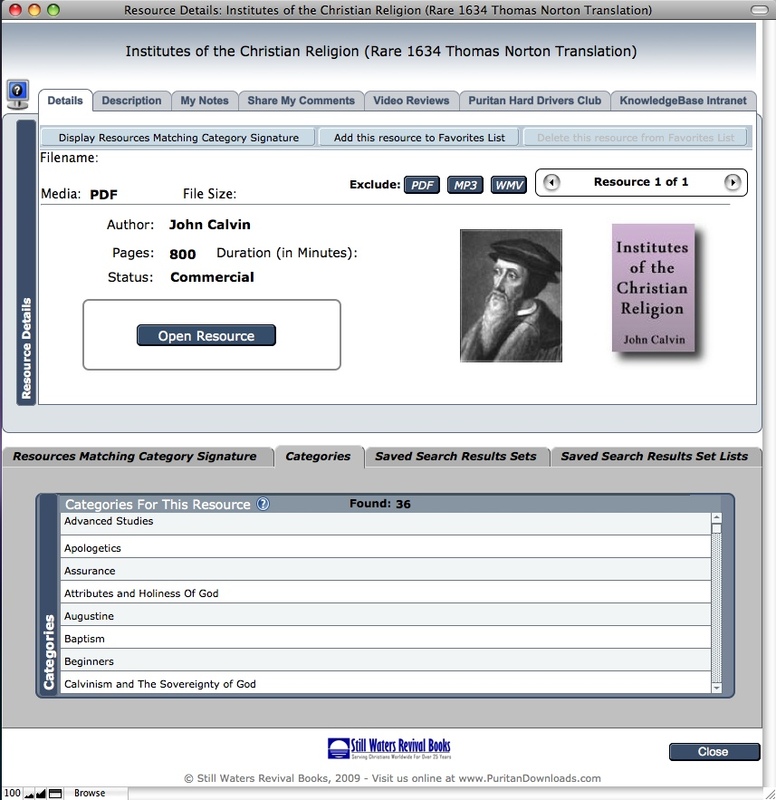 These low cost digital downloads will be completely integrated with the KnowledgeBase and database on the PURITAN HARD DRIVE and will even include the rarest of Reformation resources, which can cost thousands of dollars each on the antiquarian book market (e.g., just one eight volume set presently on the Puritan Hard Drive cost $US28,000.00 to obtain for scanning). Additionally, as an added bonus, most books on the Puritan Hard Drive are either already in text format or have been ORCed using state-of-the-art Optical Character Recognition software. 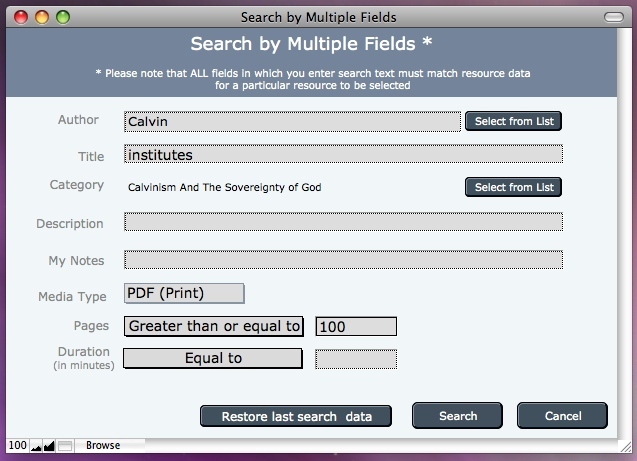 We have even embedded indexing in the OCRed books (PDFs) so that they are not only searchable, but can be searched a lighting fast speeds (see below for more details). You may also cut and paste from these books! We have also appended extensive indices to all of the searchable books to further aid you in you studies. In short, the PURITAN HARD DRIVE can greatly increase your knowledge of the Lord and His truth (by God's grace) in much less time than any other study method or tool of which we are aware. Furthermore, in the 25 years we have been building the PURITAN HARD DRIVE, only the very best resources were selected for inclusion, which means you will have virtually instant access to the very best (and most sanctified) Christian minds in history on virtually every topic you can imagine. Never before has a Christian study tool this powerful ever existed, all thanks and glory be to the Lord! Please take full advantage of the best Christian (Puritan and Reformed) study resources and cutting edge educational technology ever available, at the lowest price possible, by purchasing the PURITAN HARD DRIVE today (or before the prepublication sale ends) — you (and your family and your church) will be very thankful you did! "Study to shew thyself approved unto God, a workman that needeth not to be ashamed, rightly dividing the word of truth" (2 Timothy 2:15). Over 12,500 Classic and Contemporary Puritan and Reformation Resources On SWRB's New, Portable, USB Puritan Hard Drive (SWRB-PHD) - Now Including An Embedded Database and SWRB's New, Custom, Proprietary Search/Interface Knowledgebase Program (With Over 70,000 Category Cross References And Over 4.5 Million Records Related To Resource Category Signatures), For Easy, Virtually Effortless, Access To All 12,500+ Puritan And Reformation Resources (Books, MP3s and Videos) and the Power to Search, Build, Print and Even Save An Unlimited Number of Study Lists Related to Whatever Authors, Topics and Titles You Most Need To Know and Understand! Four screenshots from the powerful, custom SWRB KnowlegeBase program that comes with the Puritan Hard Drive are show below. CALVIN, JOHN, JOHN OWEN et al. And 117 more MP3s (sermons and audio books) by John Calvin! "Some one will therefore ask me what counsel I would like to give to a believer who thus dwells in some Egypt or Babylon where he may not worship God purely, but is forced by the common practice to accommodate himself to bad things. The first advice would be to leave [i.e. relocate--GB] if he could. . . . If someone has no way to depart, I would counsel him to consider whether it would be possible for him to abstain from all idolatry in order to preserve himself pure and spotless toward God in both body and soul. ***Then let him worship God in private*** (in his home--RB), praying him to restore his poor church to its right estate (John Calvin, Come Out From Among Them, The Anti-Nicodemite Writings of John Calvin, Protestant Heritage Press, "A Short Teatise," pp. 93-94, emphases added. Come Out From Among Them is also on the new PHP CD at http://www.swrb.com/newslett/FREEBOOK/KReed.htm). John Calvin quote (above) cited in: Appendix G in The Covenanted Reformation Defended by Greg Barrow (http://www.swrb.com/newslett/actualnls/append_g.htm), "A brief examination of Mr. Bacon's principles regarding the visible church and the use of private judgment. Also, some observations regarding his ignoble attack upon Kevin Reed in his book entitled The Visible Church in the Outer Darkness." "Now I beseech you, brethren, mark them which cause divisions and offences contrary to the (Apostolic--RB) doctrine which ye have learned; and avoid them." We have more phenomenal news for you! 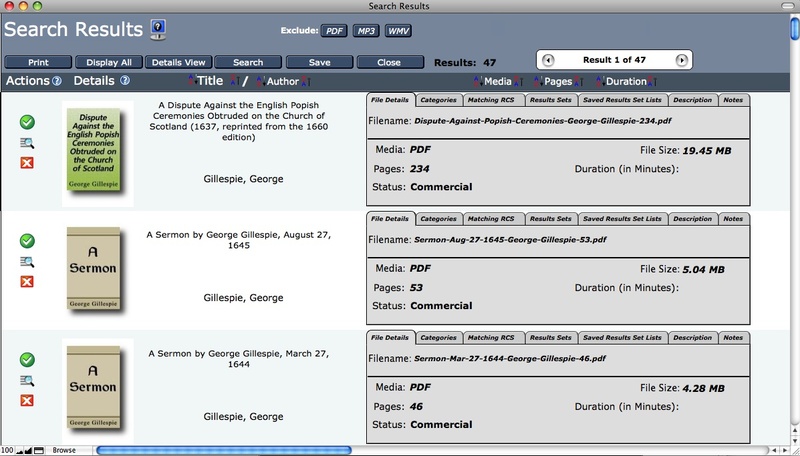 Click here to jump to the latest information and screenshots related to making most of the text in the books on the Puritan Hard Drive (PHD) searchable, indexed and "cut and pasteable" through the Optical Character Recognition (OCR). "CLASSIC PURITAN AND REFORMED SETS" PDF LISTING (99 Pages of Books, MP3s and Videos). This One Category Is Taken From the Complete CATEGORY LISTING of All 12,500+ Puritan and Reformation Resources on the NEW SWRB PURITAN HARD DRIVE. "CLASSIC PURITAN AND REFORMED SETS" BOOKS ONLY PDF LISTING (18 Pages). This PDF Shows Only the Books and Does Not Include the MP3s or Videos From Just the Category "Classic Puritan And Reformed Sets" on the NEW SWRB PURITAN HARD DRIVE. "I am overwhelmed... the CD series look priceless, and you have done a great service for the kingdom through this ministry." "Still Waters Revival Books... have released an incredible array of... compact disks which contain over 2,000 titles (remember there are over 12,500 resources on SWRB's new Puritan and Reformation Hard Drive Collection - ed.) of some of the best Reformation and Calvinistic books ever written. It is by far the best and widest collection of Reformed literature ever assembled." - The Five Points of Calvinism: Defined, Defended, and Documented, Second [Special 40th Anniversary] Edition, Updated and Expanded [p. 76, 2004, Presbyterian and Reformed Publishing Company] by David N. Steele, Curtis C. Thomas, and S. Lance Quinn, Foreword by Roger Nicole, Afterword by John MacArthur, emphases added). Was John Calvin A Covenanter? If it be inquired, then, by what things chiefly the Christian religion has a standing existence amongst us, and maintains its truth, it will be found that the following two not only occupy the principal place, but comprehend under them all the other parts, and consequently the whole substance of Christianity: this is, a knowledge, first, of the mode in which God is duly worshipped; and, secondly, of the source from which salvation is to be obtained. When these are kept out of view, though we may glory in the name Christians, our profession is empty and vain. After these come the sacraments and the government of the church... (John Calvin, The Necessity of Reforming the Church [Presbyterian Heritage Publications, 1544, reprinted 1995], p. 15). Since the evangelical faith had only recently been preached in the city, and there were still many Romanists, the ministers also urged excommunication on the grounds of failure to confess the faith. The Confession of faith, which all the citizens and inhabitants of Geneva... must promise to keep and to hold had been presented to the Council on 10 November 1536. Let the members of the Council be the first to subscribe and then the citizens, 'in order to recognize those in harmony with the Gospel and those loving rather to be of the kingdom of the pope than of the kingdom of Jesus Christ.' Those who would not subscribe were to be excommunicated (John Calvin: A Biography of the Life of John Calvin, p. 63, emphases added). 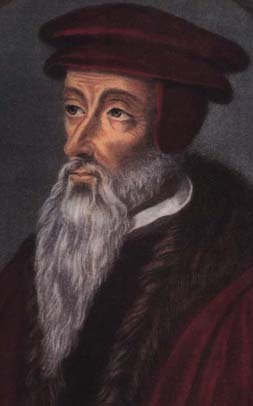 Moreover, those who would not submit to "John Calvin's" close communion were not only proceeded against with negative ecclesiastical sanctions, but they came under negative civil sanctions also. Now, it should be obvious to those who know the commandments of God that an honest man cannot swear an oath to uphold a confession that he does not believe. To do so, even if the man disagrees with only one point of the confession, is to violate both the third and ninth commandments -- and to play the Jesuit (see the Westminster Larger Catechism on the duties required and the sins forbidden concerning the third and ninth commandments; these can be found as questions and answers 112, 113, 144, and 145). Such false swearing is also, by definition, perjury (I wonder how many perjured officers reside in Presbyterian and Reformed churches today?). To encourage others to so swear is subornation to perjury. These are all serious sins in themselves and all worthy of excommunication and civil penalties -- as John Calvin and the other Genevan Reformers rightly taught and practiced. To see how closely this mirrors John Calvin's teaching, see pages 126 to 135 in The Necessity of Reforming the Church (Presbyterian Heritage Publications' edition). John Calvin, Covenanting, Close Communion and the Coming Reformation is Reformation History Notes number 2, issued Dec. 7, 1996. "A Technological Revolution In Puritan, Reformation and Covenanter Studies." More videos are forthcoming, as there are many powerful features on the Puritan Hard Drive to showcase. Another comment on SWRB's two discontinued Reformation and Puritan Bookshelf CD sets (of 62 total CDs) follows. These CD sets were greatly inferior, in every way, to the new SWRB Puritan Hard Drive, and the Puritan Hard Drive even costs less (and gets you discounts on rare and new digital downloads in the future)! "I have been systematically working through reading the Puritan and Reformed CDs I purchased... I must say, there is nothing like them available anywhere. It is the most amazing collection of works I know of in one package to date... You have done an immeasurable service for the Kingdom of Christ in making these CDs available, and every pastor and theologian should own them without question (they would be foolhardy to pass them by)." Another comment on SWRB's two discontinued Reformation and Puritan Bookshelf CD sets (of 62 total CDs) follows. These CD sets were greatly inferior, in every way, to the new SWRB Puritan Hard Drive, and the Puritan Hard Drive even costs less (and gets you discounts on new and rare digital downloads in the future)! "Still Waters Revival Books... have released an incredible array of... compact disks which contain over 2,000 titles (remember there are over 12,500 resources on SWRB's new Puritan Hard Drive Collection - ed.) of some of the best Reformation and Calvinistic books ever written. It is by far the best and widest collection of Reformed literature ever assembled." - The Five Points of Calvinism: Defined, Defended, and Documented, Second [Special 40th Anniversary] Edition, Updated and Expanded [p. 76, 2004, Presbyterian and Reformed Publishing Company] by David N. Steele, Curtis C. Thomas, and S. Lance Quinn, Foreword by Roger Nicole, Afterword by John MacArthur).